This NLP Practitioner manual is the result of 20 years research and application of NLP by one of its most innovative, practical and results oriented trainers and writers. Featuring both the Society of NLP core syllabus and many other popular NLP concepts and techniques, this book will show you how to adapt and apply NLP in any professional environment. 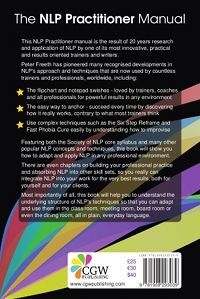 There are even chapters on building your professional practice and absorbing NLP into other skill sets, so you really can integrate NLP into your work for the very best results, both for yourself and for your clients. Most importantly of all, this book will help you to understand the underlying structure of NLP's techniques so that you can adapt and use them in the class room, meeting room, board room or even the dining room, all in plain, everyday language. I first encountered NLP 20 years ago, and one of things that has never ceased to amaze me is the number of NLP books out there that simply recycle what was written 30 years ago. The same theories about how and why certain techniques work, and the same, mystical, "You don't need to know all this, you're learning it unconsciously". Well, I never bought that, and I don't expect you to either. This book isn't for people who want to learn while in a trance. This isn't a book for people who want a Practitioner certificate just for showing up on the course. This is a Practitioner manual for people who want to thoroughly understand NLP, who want to earn their Practitioner certification. As an ex-engineer, I wanted to figure out the techniques, get inside them and adapt them. And in doing so, I discovered how much of NLP works, and that made it so easy to teach and, more importantly, so easy for Practitioner students to master. For example, there is a description of anchoring in the earliest NLP texts which has been copied, almost verbatim, in every other NLP book I've seen - and it is fundamentally wrong. No wonder students have trouble getting anchoring to work! When I teach anchoring, students find it so easy, and it's no wonder why - they're making it easy for themselves. It's the same with the swish, reframing and, I nearly forgot, Meta Model. It worries me when trainers say that the Meta Model patterns don't matter, and you don't need to remember what they're called. The absolute foundation of NLP is an understanding of how we attach symbols - words - to our experience. How can we truly understand NLP and the rich benefits that it offers if we dismiss the very foundation that it stands on? If you can't name something, how can you become a craftsman in its use? Even Bandler said that all NLP techniques can ultimately be reduced to the Meta Model. Yet I do appreciate that many trainers of NLP don’t understand it themselves, so how can they teach others? They can only teach Meta Model by rote. If a teacher doesn’t understand mathematics, how else can you learn, other than by reciting a times table? So in The NLP Practitioner Manual, I've packed in as much of my experience as I can, earned in the 20 years that I have trained over a thousand people. I hope you enjoy it as much as I enjoyed writing it. Being able to read a recipe book and follow the recipes to the letter doesn't mean you can hold a dinner party. To do that, you have to think systemically, creating the right atmosphere for your guests and serving them dishes that complement each other and arrive in the right order. A dinner party is more than just eating, it's the whole experience of an enjoyable evening with friends. Similarly, learning the tools and techniques of NLP is neither the beginning nor the end of your journey. Learning to use a saw doesn't make you a carpenter, and learning to be a carpenter doesn't make you a craftsman. Coaches, therapists, counsellors, managers, consultants, doctors, athletes, recruiters, actors, teachers, sales people, authors and entrepreneurs all benefit from learning and applying NLP. In fact, anyone who has to deal with people in their personal or professional lives can benefit. Is NLP a panacea, a cure for all ills? No, of course not. Nothing is. But it is one of the most versatile and valuable tool kits that you will ever discover, and learning NLP is a journey that will bring you value, insight and reward beyond what you may have first imagined.